Delores Tousineau writes that her aunts say Robert married Frances SMITH in 1844 in Lowndes Co. AL. Frances SMITH was the daughter of Ward SMITH and Easter EVERIDGE. Ward SMITH’s mother was Cherokee. James Madison “Red Jim” SIMMONS was b. 20 July 1845 in AL and died 18 Feb 1913 in Pike Co. MS. He married, 22 Dec. 1864, Mary E. PHELPS b. 9 Nov 1841 in Coffee Co. AL and died 8 Dec 1925 in MS. She was a daughter of Marshall and Caroline (Parker) PHELPS. Her sister, Sarah, married William Perry LANG when she was 14 years of age. Sarah and William were parents of Albert Winston who married Narcissus SIMMONS, a sister of James Madison. Mary E. Simmons, Pike County, Miss., wife of J. M. Simmons made application for pension on her husband’s Civil War record. She and J. M. Simmons were married in Pike County on Dec. 22, 1864. Her husband enlisted in Pike County in Forrest’s Cavalry, Miss. Regiment. An earlier application was filed in 1916 when Mary was 64, in which she reported herself as born in MS and was living in Pike Co., a widow of J. M. Simmons whom she married Dec. 22 1864. He resided in Newton County, MS when he enlisted in Forrest’s 4th Mississippi Regiment. He died in Magnolia, Pike Co., MS on 18 Feb 1913. He was living with his youngest son when he died. James and Mary SIMMONS joined the Bala Chitto Baptist Church in 1873. James and Mary had 9 children: William F., Austin, Robert T. “Babe”, James Marshall, David, Dudley, Samuel, Emma and Mary Elizabeth. Mary Ann “Daught” SIMMONS, b. 5 Sept 1848, d. 10 Feb 1910. Married James J. LANG b. 1854, d. 1936. James J. LANG was a son of James Jefferson LANG and thus a brother to William Perry LANG, a daughter of whose married James Madison SIMMMONS above. Mary Ann is buried in the Lang-Simmons Cemetery at Sheridan LA. James J. LANG is buried in the Union Baptist Church Cemetery at Magnolia. They had 6 children: Fannie, Monroe, Esco, Della, Mattie and Marjorie. Charles Monroe SIMMONS b. 12 July 1857, d. 24 March 1925. Married Abi Jane SANDIFER b. 15 Feb. 1861, d. 7 Dec. 1939, daughter of John W. Sandifer and Jane G. STRICKLAND. Abi was also reportedly of Cherokee descent through the STRICKLANDS (of NC and GA) and her ggrandmother Elizabeth HUNT b. abt. 1736 Barnwell Co., SC September 08, 1815 Wayne Co., GA. Abi and Charles are buried in the Ponemah Cemetery at Bogalusa, LA. Their six children were: Willie Arnold, Mary Ida, Beulah Jane, Illey Arthur, Charlie Ada and Sidney Albert. John B. SIMMONS b. 16 June 1862, d. 25 Feb 1946, married Lula “Lou” BROWN b. 2 July 1873, d. 5 Dec. 1940. Lou was a sister to Julia Brown Simmons, the wife of John B.’s nephew, William F. “Blow Gun” Simmons.) John B. and Lou ran a store in the Union community in Pike County, Miss. and “Uncle John” was one of the more prosperous members of the family. (Their large home across the road from the store was remembered by my father, Seldon Lang, as quite handsome for the time. The house burned several years after the death of John B. and Lou, but the old store building still stands on the corner, overgrown with weeds and trees in 1991.) The children of John B. and Lou Simmons were: Helmer, Alice, Jewell and Prentis. Narcissus “Narcis” “Dink” SIMMONS b. 5 Jan 1870 d. Sept 1944, married Albert Winston LANG, b. 20 Oct 1869, d. Feb. 1959. 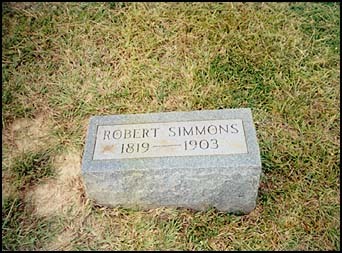 They are buried in the Lang-Simmons Cemetery at Sheridan. Their 9 children were: Iva O., Evie, Lillian and Leslie (twins), Norman and Narvel (twins), Fannie Frances, Clyde, Seldon. Robert is said to have had land in Alabama that he lost. Jean Kearns had heard a story that he was gotten drunk and signed away the land that Birmingham, AL is on. Delores Tousineau writes that her aunts had heard a story he once had land around Birmingham. NOTE: There are numerous SIMMONS and SMITHS and WILSONS in this Coffee County census. I will give a number of them. NOTE: Ann Hood 1993 communication to Bob Ann Breland notes this Alfred married an Elizabeth BYRD in Pike Co. 19 Sept. 1844. NOTE: Ann Hood 1993 communication to Bob Ann Breland notes that Milly is Amelia MALONE and that a Darcas ELLIS was living as a domestic servant in the home of a Thomas W. SIMMONS in 1880. She notes Thomas SIMMONS as being a son of John SIMMONS at household 121. NOTE: Ann Hood 1993 communication to Bob Ann Breland noted that Thomas SIMMONS in household 119 was a son of this John SIMMONS. She reported she didn’t know his parents, siblings or wife’s maiden name. NOTE: Ann Hood 1993 communication to Bob Ann Breland noted that Andrew J. SIMMONS (household 122) who married Mahala HUTCHINSON is likely a son of Levi. Thomas W. in household 126 is also given as a son. Levi is given as likely being the Levi in Dale Co. in 1840 and Pike Co. in 1830. NOTE: Ann Hood 1993 communication to Bob Ann Breland noted Thomas is a son of Levi in household 124. Ann is given as probably being a sister. 204. Robert P. BROOKS 31 GA etc. 205. Elizabeth BROOKS 50 GA etc. 233. Amelia BAKER 44 NC etc. 304. Benjamin FREEMAN 39 TN etc. 511. Harvy B. MILLER 52 SC etc. 515. David DONALSON 54 SC etc. NOTE: Ann Hood 1993 communication to Bob Ann Breland noted that he is a son of Isaac SIMMONS in household 643. He married Susannah STEWART 13 August 1844 in Pike Co. In 1860 they were in Holmes Co. FL. NOTE: A Bennett BOYETTE lives a couple house away from Ward SMITH and Frances SIMMONS (daughter of Reuben in the next household) in the 1850 Covington County Census. He was married to a Fatama UNDERWOOD. http://awt.ancestry.com/cgi-bin/igm.cgi?op=GET&db=:1779868&id=I82894660 has “Bennett J. Boyett born 1818 in Georgia. Died June 29, 1862 in Winn Parish, LA. Killed by a man named Mad Dog Smith. NOTE: Ann Hood 1993 communication to Bob Ann Breland noted that Reuben had 60 acres of land listed in Coffee County. NOTE: Ann Hood 1993 communication to Bob Ann Breland noted that Isaac SIMMONS was in Dallas Co. AL in 1830 and then in Pike Col AL in 1846. He had a wife and 2 son in both censuses. Gardner B. (household 644) and Samuel W. SIMMONS are his sons. (NOTE: Parents of Gardner were Lydia NEELY b. 1803 Elba Coffee Co. AL m. Isaac SIMMONS in 1824, Elba, Coffee Co. AL.) Ann Hood 1993 communication to Bob Ann Breland noted that Gardner was a son of Isaac in household 643, and that in 1860 he was in Holmes Co. FL. 648. Ashfield JOHNSON 52 GA etc. NOTES: http://awt.ancestry.com/cgi-bin/igm.cgi?op=GET&db=klloyd77&id=I562 b. Greene Co. GA. married Elizabeth ASHFIELD. NOTE: On the next page is a Joseph Morrow 58 b. SC with family born in AL. from the age of a 22 year old child. And an A. J. SMITH 28 b. SC with wife Elizabeth 24 and Margaret 2 and Marth A. 6/12 b. MS.
Willie or Wallie b. Jan.
Robert and Frances are buried at the Union Baptist Church Cemetery in Pike Co., MS. Frances was the first person buried there and has the oldest date of birth of anyone buried there. 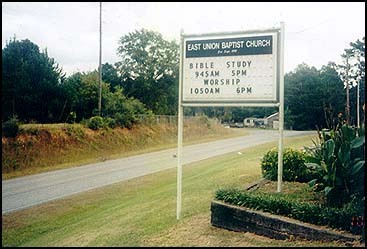 (Source: Delores Tousineau) The Union Baptist Church Cemetery is 5 miles 3ast of Magnolia. 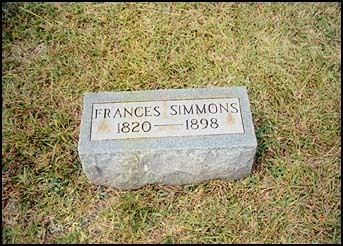 The tombstone data reads: Robert SIMMONS, 1819-1903; Frances SIMMONS, 1820-1898. Incidently, I don’t know where the name Robert (for Reuben) came from, but my father’s oldest brother, Iva Lang, had the tombstones made. He was the oldest child in my Daddy’s family, so he might have known something Daddy didn’t know about Reuben’s name. I’m sure he knew his grandfather, even though he would have probably been a child when Reuben died. I’m also pretty sure he didn’t just draw that name out of a hat. He was a pretty concise fellow. But everything I have ever found names him as Reuben. I don’t know if it is included in any of the material that you have but there is a pretty funny story about my grandmother and her daddy. Reuben traveled about a good deal visiting with his children. At the time, my grandmother and grandfather (Narcis and Albert) were living in Pike County. Reuben came to Sheridan to visit with his son Murdock “Steve” and while he was here, Reuben died. Murdock and others of the family who lived here buried him up at the Nobles Cemetery at Pine. It was freezing cold, and soon after the burial, the ground froze. Meanwhile my grandmother, up in Mississippi, who was definitely a daddy’s girl and the baby of her family, was grieving herself to death. She was pregnant with a set of twins (I don’t know if it was the first set or the second set, but dates will tell us) and she couldn’t come. She cried day and night until my grandfather came to Louisiana with a wagon to bring him back to Pike County. They had to build a fire on top of the frozen grave to thaw the ground so they could dig him up. They then transported him back to Pike County where he was buried in the Union Baptist Church Cemetery. This was probably as illegal then as it is now, but it apparently made my grandmother happy to bring him back home.